We love to catch fish! 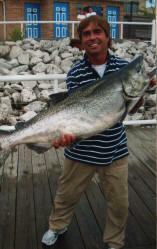 Captain Dan Fox is well experienced in fishing the water of Lake Michigan. Dan has over 40 years as a U.S.C.G licensed captain. Our experience allows you and your party to relax and enjoy great fishing, while having the confidence that our crew will provide and safe and exciting trip! "If we are fortunate enough to be selected, I personally guarantee a successful outing! I have been operating this fishing business since my college days at Marquette University (over 35 years ago!) I know what it takes to make this happen. Give us a chance, you won't regret your trip, we love to catch fish!"